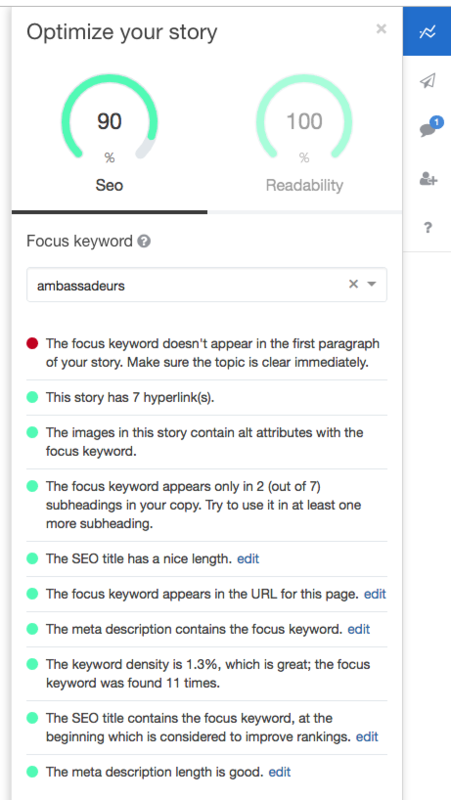 Story Chief offers valuable tips to optimize your stories for SEO and readability. When editing a story you can click on the 3 dots, and then on SEO Optimizer. The SEO section helps you to optimize your story for search-engines. Here you can enter a focus keyword to define the main keyword or keyphrase what this story is about. When the focus keyword is defined we will offer you tips on how to improve your story for search-engines. Notice that you can easily jump to the corresponding field by clicking 'edit'. The Readability section helps you to beter structure your story for readability. Notice that you can highlight tips inside your story by clicking 'show'.